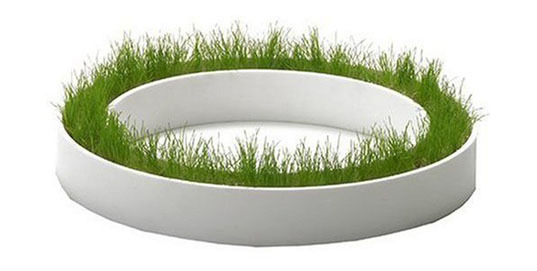 With the goal to bring the lawn indoors, Tokyo based product designer Chiaki Murata of Metaphys has designed a stylish product range of stackable white mod grass planters. The Factory product range brings the natural world indoors in style. The individual planters can be stacked, hung or laid on your coffee table. ”The Metaphys products are designed with the common idea and they are consistent with the idea even though different companies produce the products: the idea is that all the creative process should start from “observation.” By observing things, you have the perspectives of the second and the third persons, and thereby you can avoid being subjective. It represents “a discipline that explores the basic principle of all existences.” What we think is necessary is really necessary for everyday life? One of our missions is to examine how important the existence of a product is in this world of the excessive production.” Style-pd.com. Where can these be purchased? And are these available in black? I'm with Todd--where can I find these? Fantastic. Where can you buy these? The one place i found sells them in bulk packages only. I can see this in use in a lot of different ways... for pets, on fireplace mantles, integrated into wall units... cold be very cool.